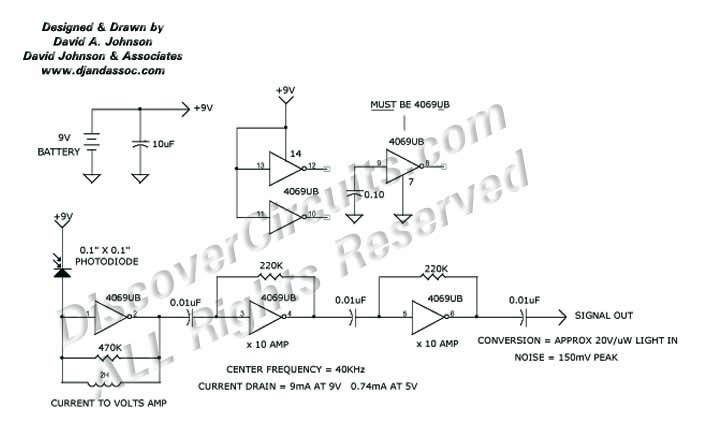 Circuit: SINGLE IC FORMS SENSITIVE MODULATED LIGHT RECEIVER __ Circuit designed by David A. Johnson, P.E. The circuit uses a very inexpensive C-MOS IC that is connected to a small photodiode. Using a unique inductive feedback network, the circuit provides high sensitivity under high ambient light conditions. It is a great circuit when you want to extend the range of an optical remote control transmitter.